Let Alfresco’s Professional Kitchen Design Team Help Make Your Outdoor Dream Kitchen Become A Reality. Alfresco was started by a well-seasoned team of experts who, in addition to manufacturing high-quality commercial kitchen equipment for decades, also specialized in the design and space-planning of commercial kitchens. An efficient and well space-planned commercial kitchen can be the key to the success of an operation. The faster the food gets out of the kitchen, the quicker the tables can turn. Alfresco is happy to now offer this expertise to its customers by assisting in the design of your dream open-air culinary space. Our zone-design strategy (shown in the diagram below) is used in Alfresco designed kitchens. 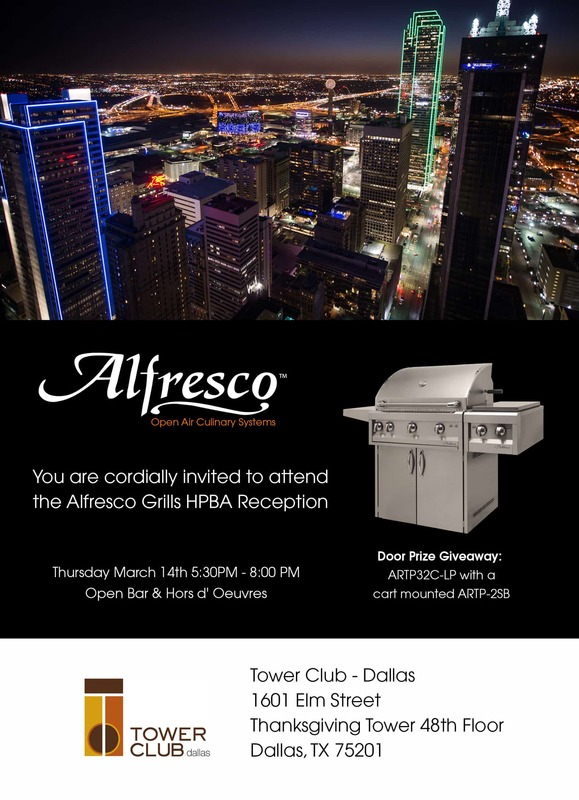 This complimentary service offered exclusively to Alfresco authorized dealers and their customers (please see below for more details). When properly designing commercial kitchens, the layout is broken into “zones”. Each zone is strategically placed for optimal ergonomic intuitive movement in order to create an ideal function, flow, comfort, and convenience for the efficient execution of masterful culinary creations. In order to receive your complimentary design, there we require specific information required to begin the process. Please make sure you have acquired all of this information outlined below in preparation for submission to your authorized Alfresco dealer. For the closest authorized Alfresco dealer in your area, please go to our Find a Dealer page under Customer Care, enter your zip code, and choose authorized dealer of your choice. Please use either our Alfresco Design Solution Worksheet with dimensions drawn in of the kitchen including details requested below. 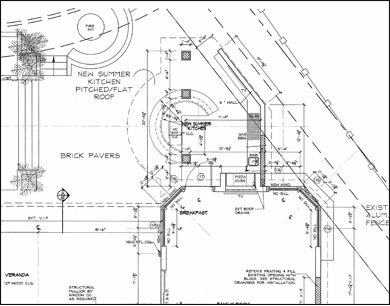 If you are providing an architects drawing, please indicate the area where the outdoor kitchen is going to be located with dimensions clearly visible on the drawing. Your drawing does not need to be to scale. Please send your project drawings, photos and complete details to your Alfresco dealer. Kitchen design projects can only be submitted to our design department through an authorized Alfresco Dealer. 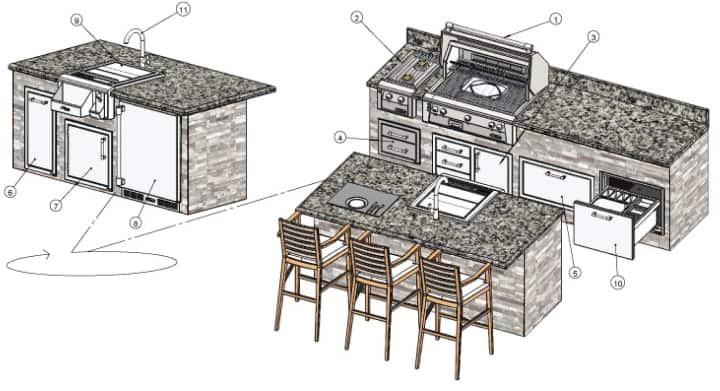 Here is an example of an architects drawing of an outdoor kitchen area with dimensions clearly marked. If you do not have professional drawings, please use our design worksheet, and make sure to provide all of the required information on the worksheet. Our drawings are not intended to be utilized by your island builder. They are for visual and space-planning purposes only. The actual dimensions are to be established by your contractor based on the actual space you have allocated to your outdoor kitchen. 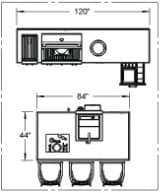 Sketch with overall dimensions showing shape of kitchen and where you would like the grill. Please recommend other convenient accessories to optimize my outdoor culinary experience. The Alfresco Grills Design Solutions helps you to take the vision of your ideal backyard kitchen and entertainment area, and make it real. Alfresco’s complementary design service will take your concept of an ideal outdoor kitchen for your backyard and will turn it into a layout that will help you realize your vision of the ultimate outdoor kitchen. 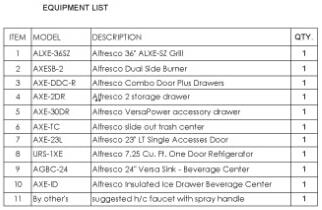 Alfresco has without question, the most complete, highest quality, and most versatile outdoor kitchen equipment product line in the world today. Make your backyard the best room in the house with Alfresco.